TCHS has developed a 2.5 hour field trip with historical programming to introduce third graders to local history. The students arrive at the historical site and participate in five 20-minute sessions, led by TCHS volunteers in period dress. 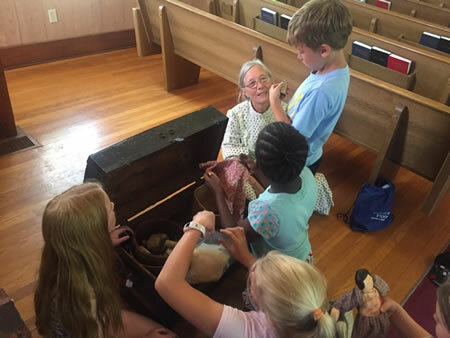 The children experience a one room school house, learn about Kanza Indian culture, customs, and daily life, experience hands-on interactions with antique tools, tour the museum, and learn some children's games of the late 1800's. For more details on this field trip, read our Third Grade Program Overview. The program qualifies for a grant from Freedom's Frontier to reimburse up to 75% of the transportation costs of the field trip. For more information on that program, click here. To expand this program to a full day, contact the museum director for more information. A hands-on exhibit of what a pioneer family would have packed to take with them in a covered wagon. TCHS volunteers are available to present this trunk to a classroom in a 30-60 minute program. Alternatively, a teacher may borrow the trunk to use in the classroom. Everything in the trunk is meant to be touched by the students. 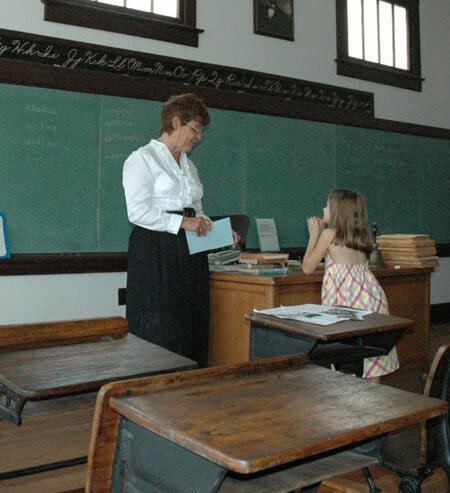 A day at the Honey Valley School is a unique way for students to experience living history. For more details on the 2018 Camp, Read More. The historic site and museum have been very successfully used as the home for the USD 464 High School Science Club's Annual Science Camp. 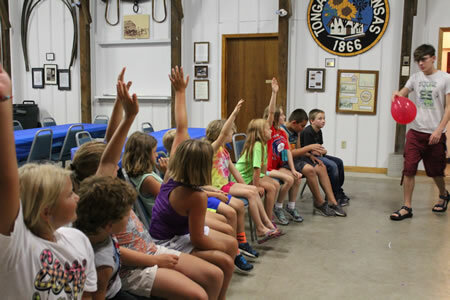 Designed to introduce students in grades 3 thru 5 to the sciences and to career opportunities for those who love science and engineering, the week long camp has operated for two years at the museum site. We are proud to have our facilities used for such a worthy community program. TCHS funds an annual $300 scholarship to a USD 464 student who is pursuing a course of study related to history. Previous recipients may re-apply for additional awards. Application form and essay can be emailed to TCHS Scholarship Committee at TCHS2002@att.net OR mailed to TCHS, PO Box 785, Tonganoxie, KS 66086. Museum Intern – Interested in learning about museums? Interested in history? If you are a student ready to head for college or already there, talk to us about opportunities for both paid and unpaid internships.